NG Advantage CEO Tom Evslin benefits from affordable natural gas, but says he still supports exporting. Vermont startup NG Advantage is looking to get more customers hooked on natural gas. The company, founded in 2011, has raised $8 million in equity and $17 million in debt financing to create an innovative natural-gas trucking system for customers in the Northeast. “What we do is really very simple, but it’s a business that didn’t exist in the United States until we started it a year ago,” says NG Advantage CEO Tom Evslin. 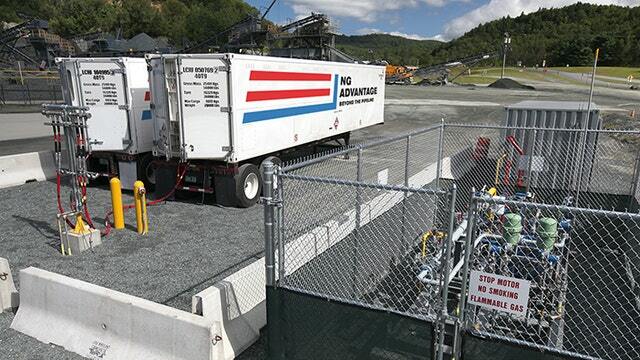 NG Advantage takes pipeline natural gas, compresses it and then carries it by special carbon-fiber-cylinder trucks to factories, hospitals and schools not near the pipelines. Evslin says the company just started raising a Series B round of equity to quickly expand its delivery. “It’s a highly capital intensive business,” says Evslin, who says that the trucks, compressor technology and off-loading equipment are all extremely expensive. Currently, NG Advantage serves clients in Vermont, New Hampshire and Massachusetts.Natural Gas Export Debate Continues NG Advantage’s crucial ingredient to success – natural gas – is at the center of an increasingly heated debate regarding exports. Lobbying group America’s Energy Advantage – with members such as Huntsman, Alcoa and Dow Chemical – argues that exporting could hurt domestic manufacturers, increase consumers’ utility bills and damage U.S. energy security. But while NG Advantage benefits from a relatively inexpensive natural gas, Evslin says he supports the free trade of natural gas. “An American economy benefits when there is free trade, and we Americans will be the loser if countries start to cut off exports one at a time or start to play games with the export market,” says Evslin. He also argues a larger market would drive investment into pipeline infrastructure. “Where there can be a pipeline, there’s good economics to build one,” he says.